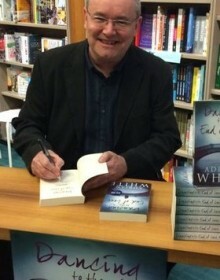 Adrian White has worked in the book trade for over thirty years. Before moving to Ireland in 1990, he worked in the UK for Blackwell’s, WH Smith and Dillons. He was the Book Manager of Eason’s in Galway for five years, moved to Eason’s head office to become a Book Buyer and rose to become Head of Buying and Marketing for Books. Since 2007, he worked for Dubray Books as Head of Business Development. This was a marketing role that included: the design, writing and editing of the Dubray Christmas Catalogue and Dubray Recommends; the introduction of the Dubray loyalty card; the publication of Mad About Books, The Dubray Books Guide to Children’s Books; and the development of the Dubray website and social media accounts. Adrian’s first novel, An Accident Waiting to Happen, was published in print by Penguin Books in 2004, described by The Bookseller as ‘Extraordinarily engaging and sensitive, wringing one’s emotions.’ In 2006, Penguin also published his second novel, Where the Rain Gets In. His third novel, Dancing to the End of Love was published by Black & White Publishing of Edinburgh in 2016. In 2011, the rights to his first two novels reverted to Adrian and he published them digitally through Smashwords and Kindle Direct Publishing, with An Accident Waiting to Happen charting in the Top 10 of Literary Fiction on Amazon UK. He also published an early version of Dancing to the End of Love through KDP with the sole intention of attracting a mainstream publisher. To coincide with the publication of Dancing to the End of Love, Adrian reprinted copies of his first two books through Kazoo Independent Publishing Services. He has attended writers’ residencies in California, Spain and Ireland and in 2009 was the Winner of a Metro Eireann Writing Award in a competition judged by Roddy Doyle. Adrian has also worked as an Editorial Consultant for The O’Brien Press. Find out more about Adrian and his writing over at Writing.ie here. Adrian is based in Galway and is available for one to one consultation with a focus on self publishing, and marketing. He is also part of the Inkwell Readers Report panel and is available for mentoring. Contact us if you would like to chat to Adrian about your project. As a writer who had her first books published before ebooks were even a glint in Amazon’s eye, I suddenly found myself a few years back, with the e-rights to seven of my previously published books. I had no clue what to do with them and, being inherently lazy, decided the best thing was to do nothing. And then I met Adrian White over a cup of coffee in a Dublin hotel. He had put his books up on Kindle and Smashwords and I was full of admiration for him and his genius. He told me there was nothing to it, that anyone, given the right information, could do the same. He promised to send me an email with some information. I really wanted to believe him, but I thought to myself, ‘This man does not know how hopeless I am with the whole computer thing.’ Then, one summer, with a bit of time on my hands, I decided that I had nothing to lose. I revisited Adrian’s helpful email and got stuck in. And guess what? It was easy! It was easy because Adrian is such an expert and his advice is spot on. My books, some of which were out of print, have been given a new life. They are on sale worldwide, finding new readers and selling well. I control the covers, the pricing, the blurbs. I get a thrill each time I log on and see what has sold. I get a bigger thrill when I check my bank account each month. I owe it all to Adrian. So thanks….